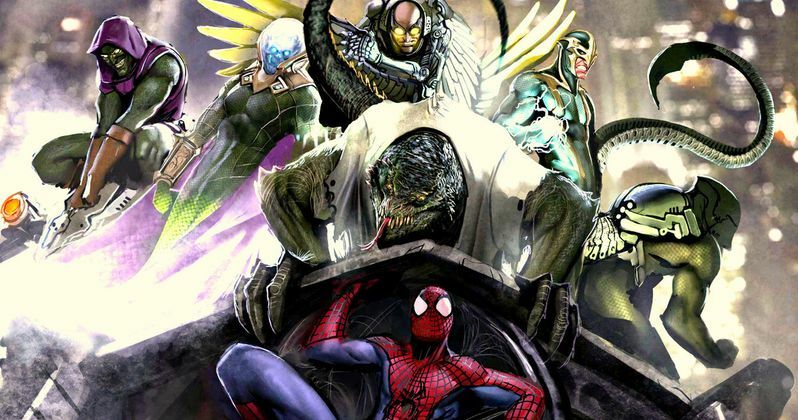 Are we going to see The Sinister Six movie after all? That could happen. And with just a few more days to go until it's in theaters, it sounds like Sony and Marvel's Spider-Man: Homecoming is laying the ground work for that to happen. A new report from MoviePilot claims that the two post-credit scenes in Homecoming are strongly pointing fans in the direction of a Sinister 6 plot. As many know, Sony was desperate to set up this super villain epic featuring all of Spidey's greatest foes. And the movie was being pushed quite hard. But it soon fell apart when Amazing Spider-Man 2 faltered at the box office, and didn't live up to its blockbuster status. It has long been confirmed that Spider-Man: Homecoming has two post-credit scenes, a staple of any movie in the MCU. And these scenes strongly suggest Sinister Six is heating up. The first scene in question comes midway through the end credits, and has Vulture locked away in jail. There, he meets former associate Mac Gargan, played by Michael Mando. Gargan is enraged by Peter Parker's involvement in his arrest, yet he doesn't know Spider-Man's true identity. Which he pressures Adrian Toomes to give up. But Vulture won't reveal Parker's identity. Instead, he hints at a future team-up with Gargan, saying this. "I've got some friends on the outside." Most are assuming that Mac Gargan will assume his comic book role as Scorpion in Spider-Man: Homecoming 2. And as stated by director Jon Watts, this is a villain we haven't heard of in previous Spider-Man movies, or seen yet. It is now being speculated that Vulture and Scorpion will lay the groundwork for Sinister 6. Even though Michael Keaton, who plays Toomes, is only signed for one movie. Some assumed that he'd be killed off in Homecoming, but that's not the case. Other villains that were supposed to be a part of Sinister 6 when Sony was first moving on the property included Sandman, Electro, and Doctor Octopus, though all of those guys have been seen in previous Spider-Man outings. The only other guy who hasn't shown his face on the big screen, who could be part of this group, is Mysterio. And there is word that Kraven may join the mix. It's unclear how a Sinister 6 movie would fall inline with the MCU, though. While bumping up against each other, Marvel's cinematic universe and Sony's Marvel Universe will not crossover, and there is no Peter Parker cameo in the planned Venom movie coming in 2018, which stars Tom Hardy. Also on the docket for the SMU is Silver and Black, which revolves around Silver Sable and Black Cat. That movie is rumored to be using Kraven and Mysterio, both of whom will get their own spin-off movies if this all works out. So if Spider-Man 2 brings in the Sinister 6, you can expect that it won't include any of those guys from the SMU, unless Sony and Marvel have plans they haven't opened up about yet. Now, for that second post-credit scene. It features Captain America in another public service announcement that seems to be pointed directly at fans. As he speaks directly to the audience about the virtues of patience. He says this. "Hi. I'm here to talk to you about patience... Sometimes it seems like it's not worth it. You wonder why you waited so long for something so disappointing..."
Funny stuff. And it's a take down of the post-credit culture and these tiny scenes not living up to expectations. It also reflects on the movie culture as a whole, waiting for these big blockbusters to only have them disappoint. And the wait for Sinister 6 has been delayed beyond reason. Now, we'll have to wait until Infinity War to find out what happens next with Spider-Man and his MCU rogues gallery compared to what the SMU has going on. We must all just have a little patience.